While Xbox One gamers will have to suffer through fuzzy textures, voxel blocks popping through the aliasing due to the game running at 792p and enough jaggies to supply prison inmates with more shivs until the end of time, the Glorious PC Master Race will be sitting atop their golden armchairs, legs crossed, arms folded and the texture resolution popping on the “insane” quality setting. 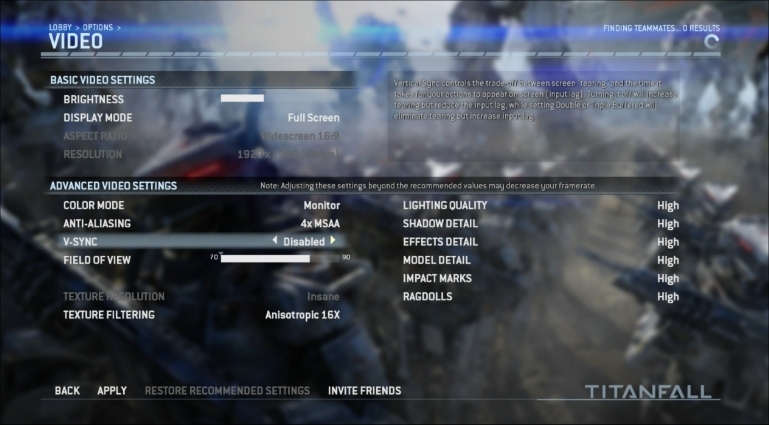 DualShocks spotted a new post on NeoGaf that rolled out some details on the PC version of Titanfall's settings, explaining what sort of features the GPCMR will be able to modify and customize on their big boy (and girl) rigs. Check out the list of graphics options below. I would love to see what sort of ragdoll features they have there. Can the titan's ragdoll? Man, do you have any idea how awesome it would be to see a titan get stuck on the edge of a building and start ragdolling? All right, enough reliving memories of just about every Far Cry multiplayer match. As noted in the DualShockers article, NeoGaf user, jediyoshi, managed screencap the options screen, so you can take a look for yourself and see that Titanfall isn't a lazy PC port that will suffer consolitis. Then again, judging from the PC vs Xbox One screenshot comparison, it's quite obvious that Titanfall doesn't suffer from consolitis (thank goodness). The one thing worth noting is that jediyoshi claims that the texture options for the game scale all the way up to “Insane”... only on PC, of course. It's such a shame because, technically, had Respawn and EA promoted Titanfall more for PC than the Xbox One, then they could tout all those fancy-schmancy graphics options not available on Microsoft's consoles. Similar to how DICE really played up Battlefield 4 on PC with the latest rendition of the Frostbite 3 Engine. As of right now, the Xbox One is looking like it's coming in behind the curve in a bad way by comparison, given that the Xbox 360 version running 720p at 60fps doesn't build a lot of confidence for its “next-generation” successor when it's only running at 792p. For now, though, I hope Respawn can outlive the hurdles of the Xbox One and make waves with Titanfall with the high-end PC crowd, where the pixel counting won't be as harsh and their visual flair will be far more appreciated. If you haven't already, be sure to Mosey your booty on over to the official Titanfall registration page to get in on that oh-so-precious beta, which gets underway tomorrow. Need details on what the beta will contain? Drop your finger on the left mouse button over this link right here and let the salivation run loose like a binge night on chili burritos.